However, the locations mentioned in the scenario are all in the Western Pacific and clearly seem to indicate the rival is China, whose advanced radar and missile capabilities make for very interesting challenges to the US Air Force’s force structure. It added: As the scenario takes place ten years in the future, it is assumed that all the kinks with integrating fifth generation fighters into the force have been ironed out, and that the F-35 and F-22 work seamlessly to aid legacy aircraft via datalink. In the opening stanza of such a conflict, the Air Force officials say that the US would send its F-35s and F-22s to a wide range of bases across the Pacific, leveraging the US’s vast network of bases and allies with some of the valuable warplanes. Such a step denies China’s ability to land a “knockout blow” as they normally could, because typically US jets stay stationed at larger bases, presenting a more attractive target. Also, by this time, the US’s fifth-generation aircraft can find airfields on their own, without the help of air traffic controllers, allowing the force to be further spread out to present less target-rich areas. 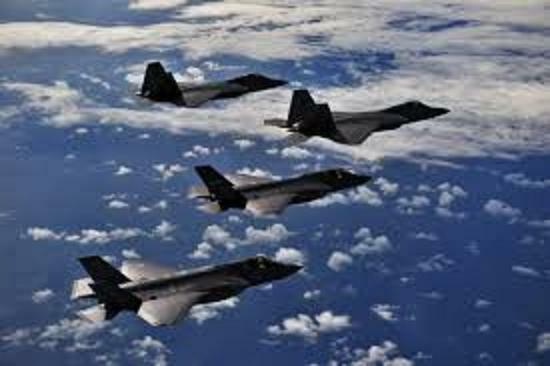 (The US would avoid large masses of airpower in the event of a conflict with China.U.S. Air Force photo/Staff Sgt. Elizabeth) Additionally, regional allies like Australia, who also fly the F-35, can quickly fill in for US airmen in a pinch. A US F-35 can land on an Australian airfield and receive much the same maintenance as it would at it’s home base, the officials claim. With the Pacific now a patchwork of small units of F-35s and F-22s, the Chinese would seek to leverage their impressive electronic warfare capabilities, but the officials contend that the fifth-gens would weather the storm. Meanwhile, legacy platforms like F-16s, F-18s, and F-15s provide a critical layer of defense closer to the US mainland. China’s formidable surface-to-air missile capabilities keep these older, more visible fighters off the front lines until the stealthier platforms, like the F-35, F-22, B-2, and the upcoming B-21 do their job. Previous post: FDA now reconsiders Gay Blood Donors – but what about blood screening?